Cars and SUVs are intended to remain upright with all four wheels on the ground. The experience of rolling or turning end-over-end in a steel vehicle is disorienting - not to mention terrifying. A Lewisville personal injury lawyer who understands the mechanics of different types of car accidents may able to negotiate more forcefully for full and fair financial compensation. At Steele Law, P.C., we take special care to remain informed about the physics of different types of car accidents, including maintaining an engineer on staff. This allows us to better serve our injured clients. The question of who or what caused the rollover accident is important because its answer determines who is responsible for providing financial compensation for the victims' medical bills, lost wages, pain and suffering. If the driver's own negligence caused the accident, the driver's no-fault insurance may provide some compensation. Injured passengers may also seek compensation from the driver's insurance company. Rollover accidents often involve trucks, buses, vans or SUVs, so there may be multiple passengers with claims. The seriousness and the types of the injuries sustained in a rollover accident can depend on several factors. Were the occupants wearing seatbelts? If so, injuries to the shoulders and neck may occur. If not, rollover accidents more frequently cause vehicle occupants to be ejected from the vehicle - resulting in broken bones, head injuries, and even death. 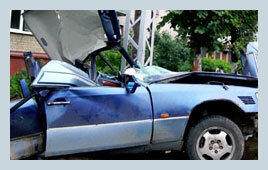 Weak vehicle roofs that become crushed during accidents can also cause major trauma to the head and neck. For a free consultation in a compassionate environment, contact the offices of Steele Law, P.C., to make an appointment with an experienced attorney. Lewisville Rollover Accident Attorney Disclaimer: The rollover accident, SUV rollover and auto accident information presented on this site should not be construed to be formal legal advice nor the formation of a lawyer or attorney client relationship. Any results portrayed here were dependent on the facts of a particular legal matter and results vary from case to case. Please contact a lawyer at Steele Law, P.C. for a consultation on your particular case.